is defined by a progressive Christian orientation to the Gospel of Jesus and by our Presbyterian heritage. 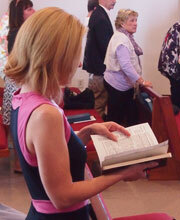 We gather for worship at 10 am every Sunday throughout the year. The focus of our worship services is to offer our praise to God and to affirm our calling in Christ’s name to service and mission. We continually find connections and lessons from the scriptures for issues we face today. By design our worship style is more informal than formal and we seek to worship in a relaxed and casual atmosphere. 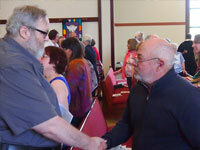 Our worship usually includes Worship Leaders who help guide the liturgy, congregational singing, the reading of Scripture, the offering of prayers, a sermon that seeks to relate the Gospel to issues and needs in contemporary life, and the celebration of the two sacraments embraced in the Protestant tradition, baptism and the Lord’s Supper. We share in the Sacrament of the Lord’s Supper on the first Sunday of each month. Worship kits for children are available in the foyer of the sanctuary, and we often look for ways to involve children in worship and to provide our congregation with mission education and service opportunities. Our church’s worship and fellowship life are both enhanced by our church’s music ministry that includes an adult choir and a social justice band (the famous “Banned from the Church”). Our congregational singing includes both traditional and contemporary hymns and our worship services are enriched periodically by our children’s choirs and our social justice band. Except during the summer months when the choir takes a break, our volunteer adult choir practices on Wednesday nights at 7:00pm and Sundays at 9:15am, before church service. We invite those who enjoy singing to speak with our Director of music about joining the choir or those who are musically gifted to participate in our worship band. Our church also provides nursery care for infants and toddlers during both our worship service and Christian Education hour.